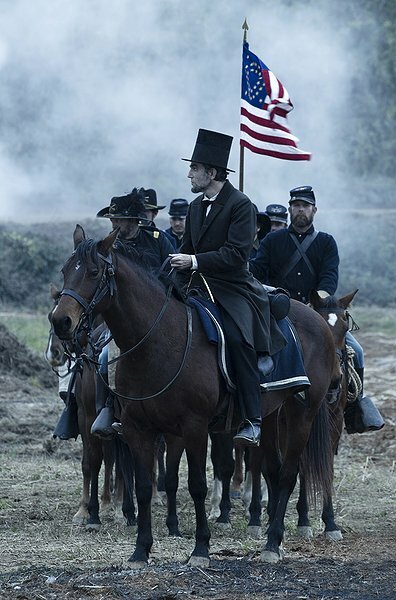 Lincoln is set in 1865 as the American Civil War is drawing to an end. U.S. President Abraham Lincoln is working both to end the war and pass the 13th amendment to the US constitution banning slavery. Part of the tension in the film is that the two aims may conflict. Lincoln believes that the amendment must be passed before the war ends. Lincoln must weigh the loss of thousands of lives that might be saved by an early peace with the continuation of a cruel and inhuman slave system. Although this film is titled “Lincoln” it is about so much more than one man. Don’t get me wrong, Daniel Day-Lewis is outstanding in the title role. He interprets a great script to show the man who was the President. His portrayal conveys a complex humanity, a man who would conceal the whole truth, offer bribes and creatively interpret the law to meet what he considered moral ends. The film doesn’t shrink from showing how adept Lincoln was at clinching the backroom deals of the 1865 congress. Daniel Day Lewis achieves something remarkable – you almost forget that you are watching an actor as he tells homespun stories and anecdotes which infuriate some and enthrall others. Yet the real strength of the film is the ensemble cast. Lincoln is an unusual film in that many characters are given screen time. There are over 120 speaking parts! There are so many excellent performances it is difficult, almost unfair, to single out certain ones for special mention. Joseph Gordon-Levitt playing Lincoln’s oldest son, Robert Todd, James Spader as a morally challenged vote procurer,Tommy Lee Jones playing Thaddeus Stevens, the passionate Republican and abolitionist, Sally Field as the president’s devoted wife, Mary Todd, and David Strathairn as William Seward, the secretary of state. The film shies away from stating clearly that Lincoln was, despite his hatred of slavery, far from a straight-forward abolitionist. Lincoln was, at best, inconsistent and by his own account he put saving the Union above abolishing slavery. He also favoured sending black people to other countries. Perhaps for this reason some have suggested that the film sanitises Lincoln. That may be too harsh but certainly the complexity of his political views are not conveyed. Leaving aside the historical arguments, however, this is a fascinating, educational and entertaining film with a great cast. Hopefully it will encourage people to find out more about Lincoln, slavery and the causes and issues of the American Civil War.